The role of garage door springs is to balance the door, pull it up and lower it down. In order to do this, they are installed under tension. Extension spring coils stretch and contract and torsion spring coils spin to develop torque. Their movement is passed to the cables, which in turn hold the door's weight and help the springs counterbalance and move the door. The weight of the door determines the size of the springs chosen. If the door weighs 400 pounds, spring power must be equivalent to 400 pounds so that they can use it to pull against the door's weight. When it comes to extension garage door springs, this power is split between the two springs since they come in pairs. Each spring will have force equivalent to 200 pounds. Adjusting and replacing springs can be dangerous because of this force and our company is here to provide the necessary garage door repair services. 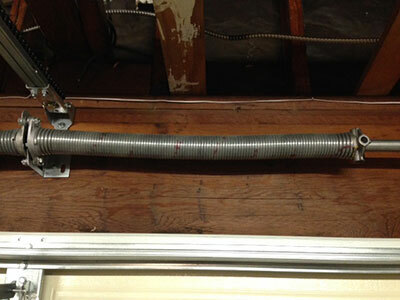 A pair of extension springs is usually enough for average residential doors. One end is often an open loop, which is attached to the track angle iron. The other part is connected to the pulley with a fork and is attached to the cable clip. One end of the cable is attached to this clip with an s-hook and the other cable end goes over a second pulley and is connected to the bottom bracket. When you click the button to open the door, the coils of the spring contract and transfer their power to the cable so that the door can be pulled. This is the spring installed over the door. Most home doors need one torsion spring but double car doors are wider and heavier and would need two torsion springs installed. There is a metal tube that passes through the spring to keep it in place. This is the shaft, where the cable drums sit. When the remote is pressed, the spring unwinds stretching across the shaft and creating torque, which is transferred to the tube and from there to the cables through the drums. In this way, the door is pulled to open. These are called EZ-set springs because they are easier to install than springs made by other manufacturers. Instead of using winding bars to install torsion springs, the ones made by Clopay require a drill. Two more distinctive characteristics of these springs are the gaps separating coils from each other and the spacer used during installation to keep the spring stretched to the right length. If your overhead door doesn't go up even if you try to open it manually, there are usually spring problems. Broken springs keep the door on the floor since no other part of the system has sufficient force to lift it. Such serious issues are taken care of by Garage Door Repair Antelope as soon as possible. We replace broken springs, offer spring adjustment service, install both torsion and extension springs, and can order new ones for you. Whenever you need spring repairs, call our number.